While many are familiar with such concepts as zodiac signs, few are aware that the week in which you were born can also hold special significance. Furthermore, the week number of your birth is tied to a particular spirit animal. And your spirit animal not only will show you things about yourself, but it will offer you life lessons as well. If you were born the first week of the month, your spirit animal is the Mighty Bear. People with the bear spirit animal often go through waves of high and low energy. Chances are, you prefer to spend the winter hibernating. The summer months, however, will find you outdoors as much as possible. 1. Expand your strength and confidence. 2. Though it scares you, learn to take a leadership role against adversity. 3. You are a healer. Use that for yourself and for others as well. 4. Life can be stressful, but you must learn to ground yourself. 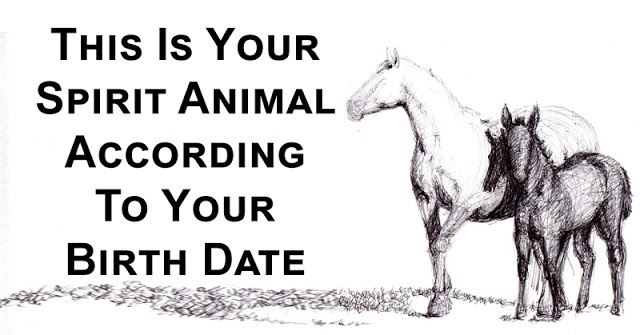 If you were born the second week of the month, your spirit animal is the Graceful Horse. If your spirit animal is the horse, you have a strong personal drive and zest for life. Your strong motivation burns like an undying fire. It will carry you throughout your life, serving you well when projects stall or plans backfire. 1. Learn a healthy balance of instinct and logic. 2. Couple a tender grace with your strength to help you through the hard times. 3. You must learn to master your strong emotions and control your passionate desires. If you were born the third week of the month, your spirit animal is the Soaring Hawk. With the hawk as your spirit guide, you have a keen sense of vision and intuition. Nothing gets past you! However, you like take your time to look at the big picture rather than hastily zeroing in on the truth. 2. While your visual skills are already insurmountable, still you must sharpen your focus. 3. Sometimes, you must not hesitate to act. Trust your instincts. If you were born the fourth week of the month, your spirit animal is the Intuitive Deer. This means you are highly sensitive, empathetic, and exceptionally intuitive. You also have the remarkable ability to deal with challenges in a graceful manner and you take everything in stride. Over the years, you have come to trust your instincts to get you out of perilous situations. 1. Your gentleness is not a weakness. Trust it. It will give you strength. 2. Empathy doesn’t always equate to compassionate actions. Learn to care for others. 3. Because you feel things so deeply, you need more time than others do to heal emotionally. Be patient with yourself.